These empty chairs were meant for you. “I feel like I’d be less of a person, a bad employee, if I didn’t work on vacation,” says Jermaine Turner, director of current series for Walt Disney Pictures Animation in a recent BusinessWeek.com article. That is a remarkable finding: the majority of us take less than one third of our vacation time. And on those rare occasions when we do break away, we bring work along with us. Why? If the Devil’s greatest accomplishment is convincing the world he doesn’t exist, employers’ greatest accomplishment is convincing workers they are indispensible. It is a crafty enough trick to be worthy of the Great Deceiver. Convince everyone they’re needed, absolutely essential. Stroke their egos sufficiently to make them want to spend uncompensated hours working for you. It is diabolically brilliant. And absolutely untrue. Long after we’re gone, the world will continue to move on as it always has – completely indifferent to our passing. After a short period of adjustment, our life’s work will be picked up by someone else. They too will be made to feel irreplaceable up until the point they are replaced, either out of necessity or convenience. This was never clearer than with the untimely passing of celebrity CEO Steve Jobs in October 2011. 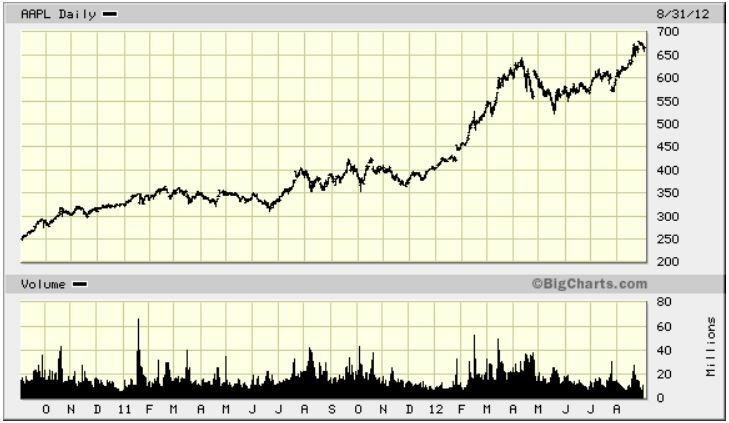 Do you see the impact in Apple’s stock chart? Neither do I. If Apple can hit new highs and become the world’s most valuable company within a year of losing Steve Jobs, clearly your office can manage five days without you. So on this Labor Day make a commitment to use the rest of your vacation time; not only in 2012 but in every year. It is, after all, a piece of your compensation package. And one that is more valuable than money. You are so right. I am leaving the majority of my vacation time unused this year not because I am indispensable but because my wife refuses to go anywhere due to her depression and other reasons. I had a trip to Germany planned that fell through but I will try to make it up in 2013. Time away is a gift and must be used … wisely. Thanks for writing this and all you post! 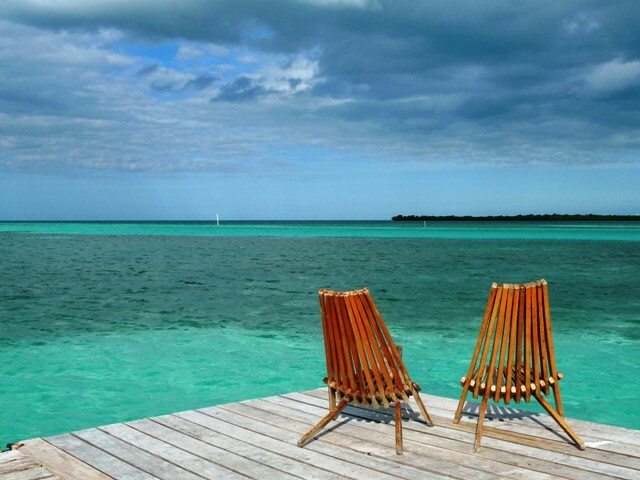 We certainly understand that taking a proper vacation isn’t always feasible. But if you get paid time off and can’t carry over days, you’re working those days for free by not taking the time. Leaving 10 days of vacation on the table is like declining an entire paycheck – nobody ever declines a paycheck. And you don’t have to take all the time at once. A mental health day here and there really pays dividends. You’re right again, Brian. Last week I took off Thursday and Friday with two of my friends to see my Cardinals play the Nationals in D.C. Although the results of the game wasn’t what I would have liked, we had a great time and I learned a few things about that city I didn’t know before. It was refreshing–even the drive to and from there. Thank you for sharing! I was a victim of this notion for the past 7 years! i always felt that the best employer is the one who make his employees feel that they are NOT indispensable! otherwise employees start acting smart and become too demanding..at least most of the one I have seen do. Yup, there is definitely a power dynamic at work too. But if you want to engender the sentiment expressed in the first quote: “I’d feel like less of a person if I didn’t work on my vacation” you really need more than just a power play. Those empty chairs were, are and will be meant for me. I’ve actually experienced that if you ‘use up’ your allocated vacation, annual, sick or whatever type of leave you have available, it’s frowned-upon by upper management, and they DO let you know this whether it’s a heavy sigh on the other end of the phone or ‘in so many words’ in an email about their ‘concern’ about you. THIS is most likely the reason why employees do not use up their vacation time AND work while they are on vacation. It’s been a tough economy since the whole banking debacle in 2008 and there certainly are few signs of improvement—unless you’re part of the ‘Wealthiest 1% Club’. What you say is true in a lot of instances. But we have to wonder why it is that bosses feel entitled to your uncompensated labor. And why, as a nation, we’re so quick to give it to them. Sure, we’ve had a bad jobs market for the past several years, but that doesn’t explain a situation that pre-dates 2008. I think the answer is that culturally we value money and work more than our time. We generally don’t negotiate for more time off, preferring monetary compensation instead. And as a group we don’t take off the time we’re allowed, so bosses look down on the few who do. So I agree that what I’m suggesting goes against cultural norms. It is never easy to buck convention. But the only way to change conventions that are stifling, and quite frankly wrong, is to buck them – an idea that is a recurring theme on this blog. And the risks to doing so in this case are usually overstated. As a former employer, I may have given the individual who takes all her vacation days a hard time, but if she makes my life easier by turning in quality work without complaint the other ~50 weeks of the year, her job is very safe notwithstanding the ribbing. Perhaps having a job for over a decade plus at the same place has made me skittish enough into thinking that perhaps I’m a little too far up the food chain. I’m generally pessimistic from experience but perform with optimism at work (and yes – it takes a lot out of me). I agree that one size does not fit all. But maybe there are ways you can demonstrate (or increase) your value to your employer other than giving up more of your time. I shall think about this…thank you. Meaningful post by the way! we are human, and no one answer speaks to everyone. some employees are super concensious and want to do a good job, some are insecure and are afraid of making the least little mistake and loosing their job, believing they are easily replaced. Employers and bosses are doing their job, getting the most production for dollar spent. We must takea control of our lives and our destiny, to be like you Brian and live our dream. I love you blog, and enjoy reading it regularly. thanks for sharing yoru travels with us. Hear hear, allotted holiday is so short in the US – it is criminal not to use it up! Excellent post and so VERY true. If I don’t take all my vacation time I go insane. I can’t handle it. I can’t believe the majority of us don’t use the time. One week to Vietnam for Chinese National Holiday , tickets bought , hotels booked. Haha. So true. I’ve started to cut down on the hours that I spend at work. I’d rather do without certain luxuries and have more free time. Back in the old days, IBM allowed employees to “carry over” unused vacation days from year to year. When they decided this was bad for the bottom line and phased out the practice, there were people with 60-70 accumulated days! I, on the other hand, having grown up in the UK took every day I had – and was unhappy that I initially lost a week when I switched from the UK to US payrolls. I think that these days some of it is fear that “they” will realize they can get along without you, but that wasn’t the case at IBM in the pre-Gerstner era. Perhaps that vaunted Protestant work ethic? “The vaunted Protestant work ethic” is a big part of it, I think. So very true! Love this post! Absolutely with you 100% Brian. Although there is one job that makes us indispensible especially if we are not there…..there will always be a sense of lack or loss, and that is as a parent. I was reliably informed of this by my 15 year old last night. I’m away for 4 days (quite unusual in our family) and she really doesn’t want me to go. And it’s unpaid!! Absolutely! I’m convinced that the English language is in some ways deficient. The words “work” and “job” do not distinguish between the incredibly valuable and rewarding kinds and filing TPS reports. Too often we confuse the two and invest ourselves in the latter at the expense of the former. I always worked in the non-profit sector so the pay wasn’t very good but the provided good vacation benefit. I used it, all and some. One day I walked into my bosses office (we had a tremendous amount of respect for and trust in each other) and told her I was going to be sick on April 24. She said, Pat you can’t do that. I said I just want you to know I won’t be here on that day and will be using a sick day. Very important to use them to stay healthy physically and emotionally. Too funny. Good for you. You are so right! Before I retired I feared certain things at the Company would fall by the wayside. I even offered to “help”. That was 2-months ago. I have never received a call or email asking for help, so apparently my former employer is doing just fine without me. I don’t however think it’s a conspiracy. I think sometimes even they believe it, until you’re gone and life somehow manages to go on. Maybe a little differently, but it does. Thanks for the post. I think I’ll repost it if you don’t mind. And I agree. I don’t think it is a conspiracy either. I do believe, however, that we’re victims of cultural “group think” that equates what we do professionally with who we are personally. Within minutes of meeting someone for the first time we ask, or are asked, “What do you do?” The answer is never (the more interesting) “I’m an amateur musician with a particular fondness for Wagner” but rather (the more self-important) “I’m the Regional Director of Widget Marketing.” I think if we measured our self-worth more by the things we do voluntarily we’d be less inclined to volunteer our time for the things we do professionally. Ah, delicious irony. So true. And that question is so American. Absolutely – very well said. I have resisted carrying a smart phone or blackberry, and I don’t give out my cell number except to a few of my employees. The world will not end if I don’t respond for a few days – and it if something is truly critical and must be done now, someone will do it. My boss sadly, has a different approach, and has trained people that her vacation is not sacred. She gets calls on days off, offers to come in, rearranges her schedule to make a meeting someone scheduled on her day off. I find it really sad, and a sure fire recipe for burnout. I am a believer in not even talking about work when I’m not at work, so I agree completely! Time off is so valuable. Right now I have only one day off a week and that in itself is a crime. I guess I’m the rare one – I almost always take all of my vacation and then end up wishing I had carried it forward the next year! This is depressing. Many of my coworkers ‘save’ their vacation. For? Before he met me, my husband almost never took a vacation and amassed hundreds of hours of vacation leave (he gets to carry it over, fortunately). Now, however, he uses every single day and we travel the world with it. According to who you talk to, I’m either a bad or good influence 🙂 Unless you absolutely love your job with a passion, life is too short to spend all your time there. This is such an important post. Cheers for sharing it. Yes! Great post! Ha! I was told I would be so bored if I retired early and would be missed greatly. They managed to replace me very quickly and I am so not bored! Very well written and you make a great point! We all need that vacation time to recharge. In the long run we are better employees for having taken some time off. Love this line from “The Usual Suspects,” “If the Devil’s greatest accomplishment is convincing the world he doesn’t exist … ” You make an excellent point, Brian. I go in early, leave late and often work at home. (I’m a teacher.) I also don’t claim that time. To me, it’s just part of the job … what’s needed to get it done. When time time comes for summer vacation, you better believe I’m winding down and recharging. Wow fantastic post. I am printing this out and sharing this with my boss. He is obsessed with his job and this post speaks directly to him. He is one of those will lose a week or two each year. On the other hand I am not one of those people. I value my time off immensely and I use ever day possible and enjoy each one. This post is needed more than ever in our society. A couple of decades and emploers back, my “vacation” days, holidays, and sick days (e.g. when I just took a couple of days off for a cold) were lumped into “paid annual leave” days. This has two sides: use them all up vacationing and then get sick or forget to allocate some for the end of the year holidays and you are stuck with taking time without pay. Or, my preferred strategy, keep healthy and have more days for travel! Our strategy was to save some days for emegencies and then if they weren’t needed use them around Christmas and New Years.